Digital images display in colour when the image is comprised of three colour channels - Red, Green and Blue. Monochrome images are monochrome up until the point they are colour-combined into an RGB colour image. These Red, Green and Blue colour channel images could literally be Red, Green and Blue - captured through respective filters. They could also be narrowband monochrome images that you wish to make a colour image out of. Either way, monochrome images need to occupy Red, Green and Blue colour channels in order to produce a colour image. 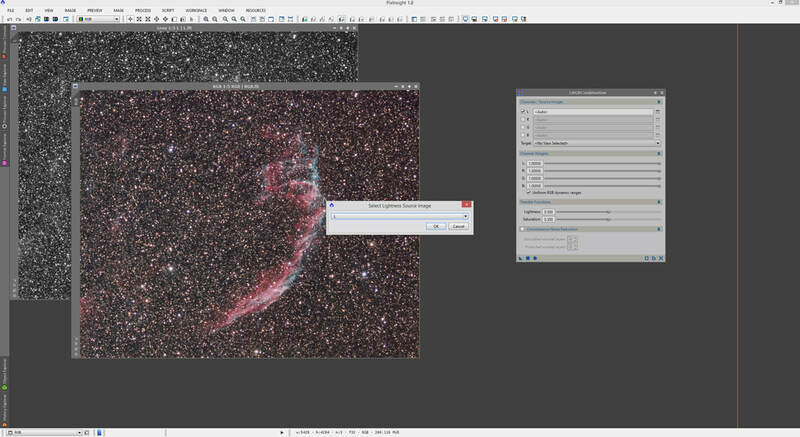 PixInsight has multiple ways to colour-combine monochrome images. Once you are working with a colour image, you may wish to apply a monochrome Luminance image to it. This tutorial covers both, colour-combining monochrome images (via two different methods - using ChannelCombination and using PixelMath) and the application of a monochrome Luminance image to this colour image (using LRGBCombination). Your individual monochrome images to be colour-combined have already been prepared by registering them with each other, cropping any black edges, subtracting background gradients and matching their brightness levels (read this). 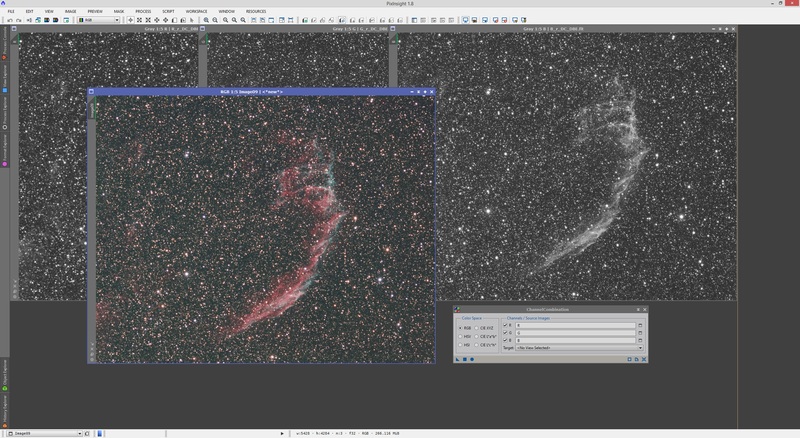 We start this section with opening the monochrome Red, Green and Blue images in PixInsight. These have already been prepared as per the assumptions for this tutorial. Below, these images are shown auto-stretched. We will be colour-combining images with the ChannelCombination process, which we open. The process is very simple. We keep RGB selected under Color Space as we will be creating an RGB colour image. On the right side, we keep all three, R, G and B enabled. We need to select the correct monochrome image for each channel. Simply click the button next to the text box for each of the three and select the correct image that is open in PixInsight. The above screenshots show the selection of the correct image for the Red channel. We repeat the process for the Green and Blue channels to have all three correctly selected. Your image identifiers may vary depending on what you called them. This should be very easy as long as you clearly identify which one is Red, which one is Green and which one is Blue. We are effectively done! 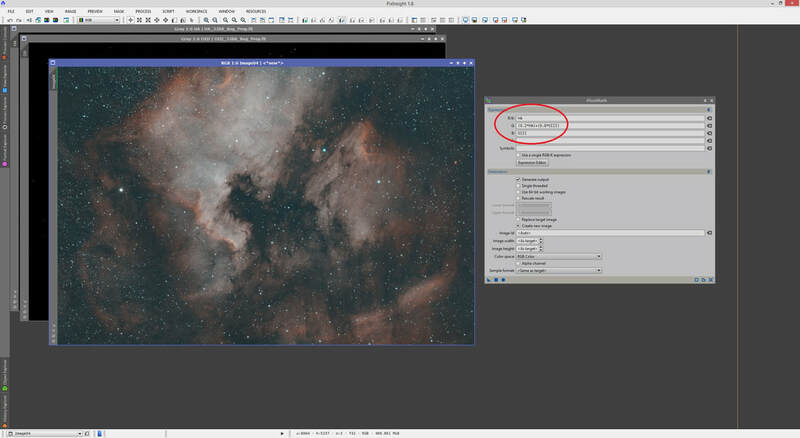 Simply click the circle button for Apply Global to create a new image in PixInsight, which is our RGB colour image. An auto-stretch reveals our RGB colour image while maintaining its linearity. 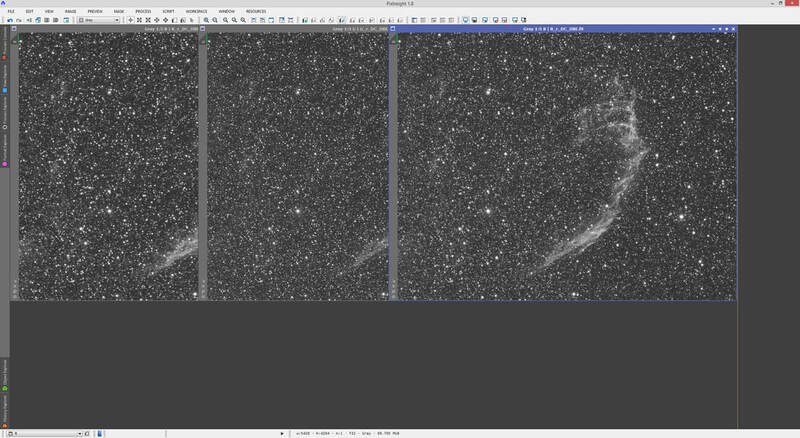 This is now ready to be post-processed alongside a Luminance image, or on its own. Normally, a colour calibration procedure would follow immediately after this image's creation, and this is the discussion of another tutorial. As with the previous section, we start this section with opening the monochrome Red, Green and Blue images in PixInsight. These have already been prepared as per the assumptions for this tutorial. Below, these images are shown auto-stretched. We now open the PixelMath process, which we will use for colour-combination. This process is extremely powerful in that it can do pretty much anything - it is appropriately named PixelMath after all! This process is also a nice way in which we can create a new RGB colour image out of monochrome ones populating colour channels. By default, this process is forcing you to work in monochrome through the single RGB/K text box provided. 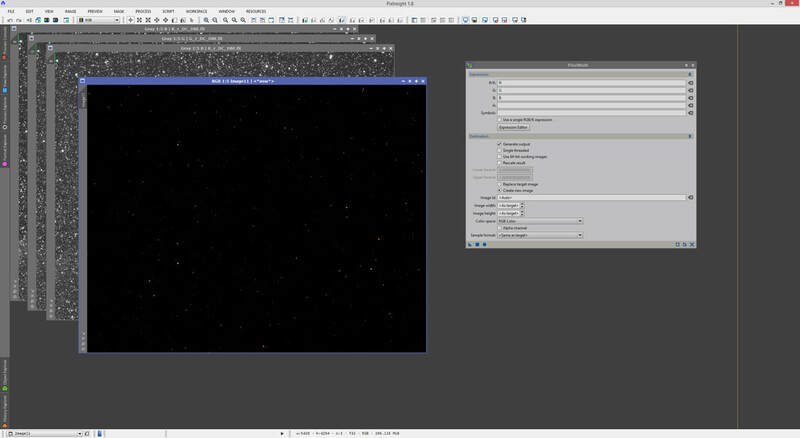 To enable the other colour channels, we disable Use a single RGB/K expression. 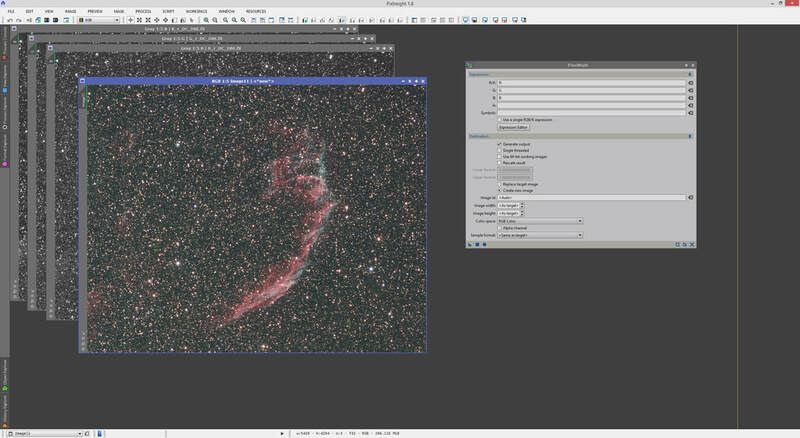 Since we want to create a new image, rather than replace one currently open, we select the option Create new image and then select RGB Color from the Color space drop-down list. Make sure the Rescale result option is left disabled as we do not want to rescale our RGB colour image - we want to maintain the monochrome images as they are, except colour-combined. ​All that is left to do is type in the image identifiers in the corresponding colour channels. In R/K, we type in the Red image identifier. In G, we type in the Green image identifier. In B, we type in the Blue image identifier. 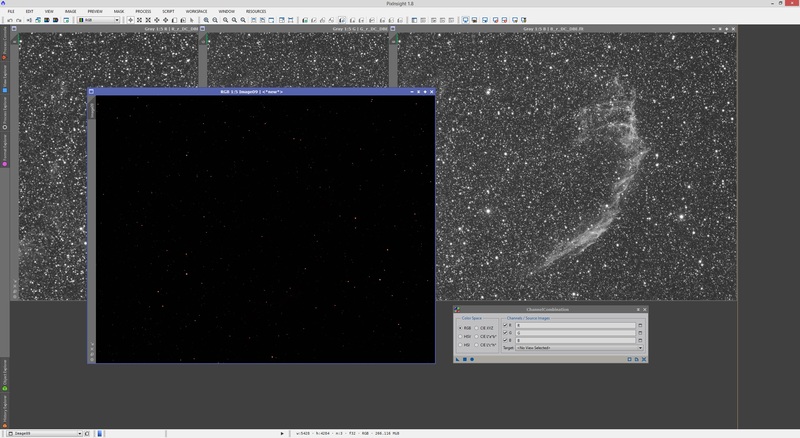 Mine are very simply called R, G and B within PixInsight and I therefore simply type in these identifiers. 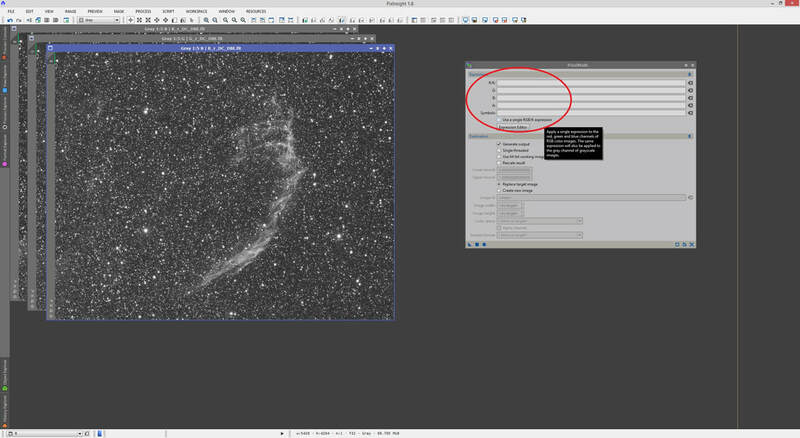 Your identifiers may vary, particularly if your images have awkward filenames and you have not bothered to manually change their identifiers within PixInsight. Still, as long as you know for sure which one is Red, which one is Green and which one is Blue, you are covered. Once entered, click the square Apply button. 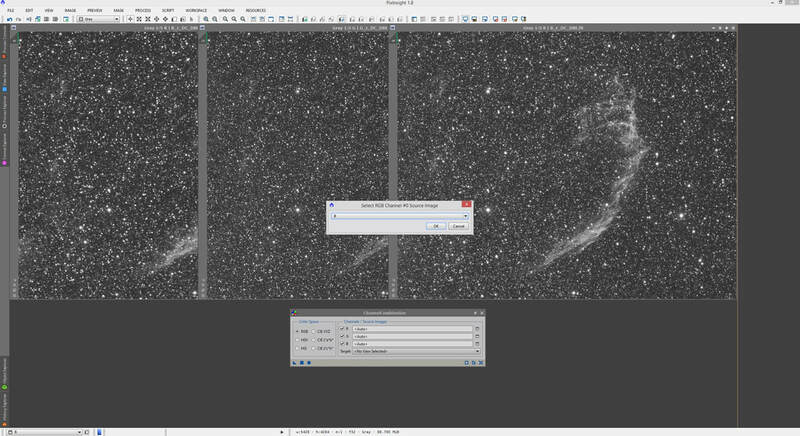 Please make sure that before you do, that your monochrome images are active windows in PixInsight (as shown in my screenshots) and are not minimised into image icons, otherwise PixelMath will throw out an error that there is no active image window. An auto-stretch quickly reveals our colour-combined image while maintaining its linearity. You may choose to always use ChannelCombination rather than PixelMath, since it clearly is somewhat simpler. However, when working with purely narrowband images and wishing to colour-combine them with weightings assigned or combinations of images in each colour channel,PixelMath makes things tremendously simple since it allows you to enter expressions in each colour channel. 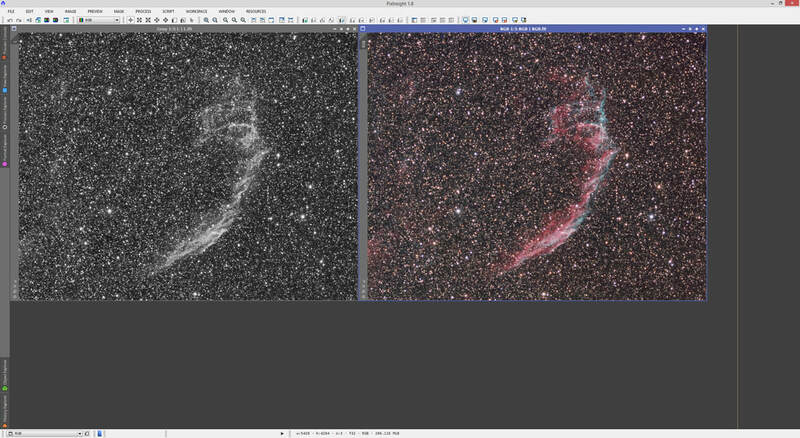 For example, the following quickly shows a narrowband bicolour palette combination of Hydrogen-Alpha and Oxygen-III, made into an RGB colour image with custom weightings and combinations. The details of this technique and the various uses for narrowband images are the subject of another tutorial, but they are provided here to provide clarity as to why PixelMath can be more useful than ChannelCombination. When working with pure RGB images however, ChannelCombination more than suffices. When imaging in LRGB, undoubtedly you will wish to eventually use your Luminance image to enhance the RGB colour image you have just created with your Red, Green and Blue images. 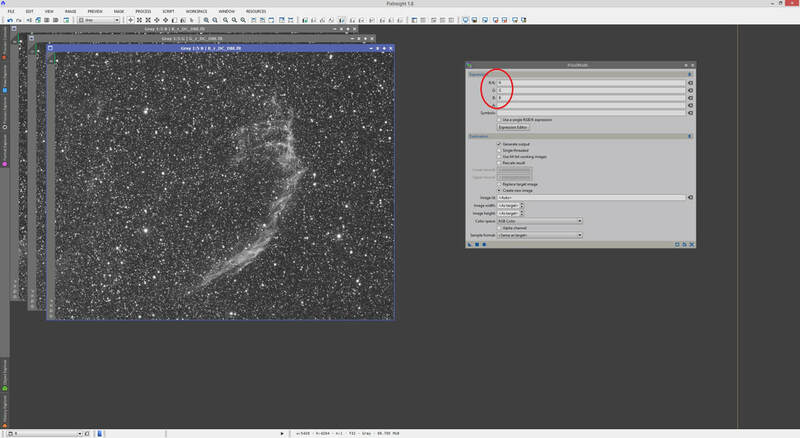 This is particularly useful since you can commit your Luminance image to bring out fine contrast and details, with a low noise background and high spatial resolution, to later apply it to the RGB colour image and bring out these fine features. Generally one post-processes Luminance and the colour-combined RGB image separately, only to combine them later. The LRGBCombination process is used for this, but this process requires both the Luminance image and the RGB colour image you are applying it to, are non-linear (have been stretched). This is not a problem because after all, you are post-processing the Luminance and RGB colour images separately and stretching these to non-linear is part of that post-processing. Given LRGBCombination's non-linear requirements, below are a Luminance image and RGB colour image that have been stretched. 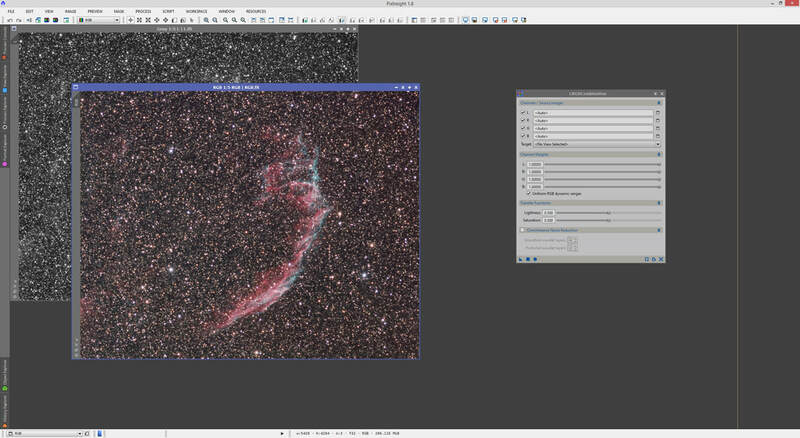 They also received some quick post-processing, for demonstration purposes. We set these aside and open the LRGBCombination process. What we will be doing is selecting our Luminance image here and applying it to the RGB colour image. 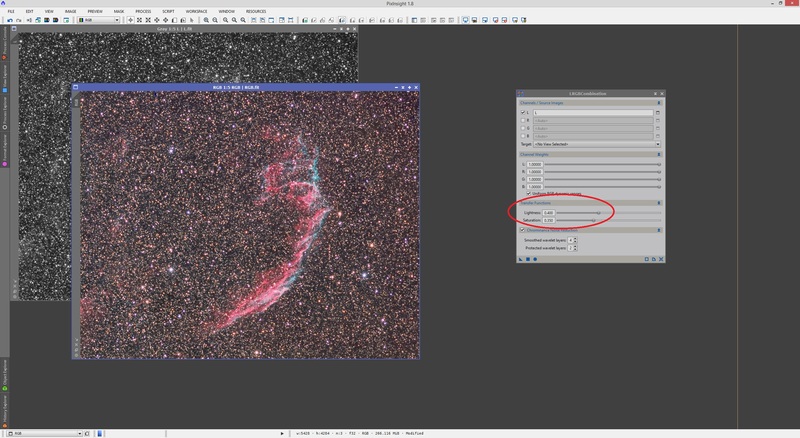 As a result, we should disable R, G and B as these will already be present from our RGB colour image. We now select our Luminance image for the L channel. To do this, click the button next to the text box for L and select the Luminance image. At this point we look at LRGBCombination's other functions. Under Channel Weights, we can define how much each channel is worth once we combine Luminance over the RGB colour image. This is not something really worth touching and everything should be left at the default 1.00000, with Uniform RGB dynamic ranges kept enabled. Transfer Functions can be useful. At their defaults of 0.500, these do nothing to the image once Luminance is combined. If you decrease Lightness to a value below 0.500, a stretch will happen to the lightness in the image to make it brighter. If you increase Lightness to a value above 0.500, a compression will happen to lightness in the image to make it less bright. The Saturation parameter works identically. If you decrease Saturation to a value below 0.500, there will be a boost to overall colour saturation. If you increase Saturation to a value above 0.500, there will be a loss of overall colour saturation. Experimentation with your own images is key to finding good settings. You may choose to tweak these or not - I normally do not touch these at all and instead choose to use something like CurvesTransformation at the very end, for some extra lightness, contrast and colour saturation. Chrominance Noise Reduction is actually pretty useful. This functions aims to reduce overall colour noise in the combined image and default settings here work wonderfully well. It is worth enabling this function. Once ready to combine, make sure you click the RGB colour image to select it and then click LRGBCombination's square Apply button, or drag and drop the New Instance button over the RGB colour image. A clear difference in the image is observed once Luminance is combined, depending on what your post-processed Luminance image brings to the table. In mine it has brought tighter stars, higher detail contrast, sharper fine details and an increase in overall brightness in the nebulosity. Digitally-speaking, you are still working with an RGB colour image, since colour images are identified by three colour channels (Red, Green and Blue) combined into one single image. However, loosely-speaking, this is now an LRGB image. Either way you think of it, what LRGBCombination has done is replace your RGB colour image's original lightness with your Luminance image. 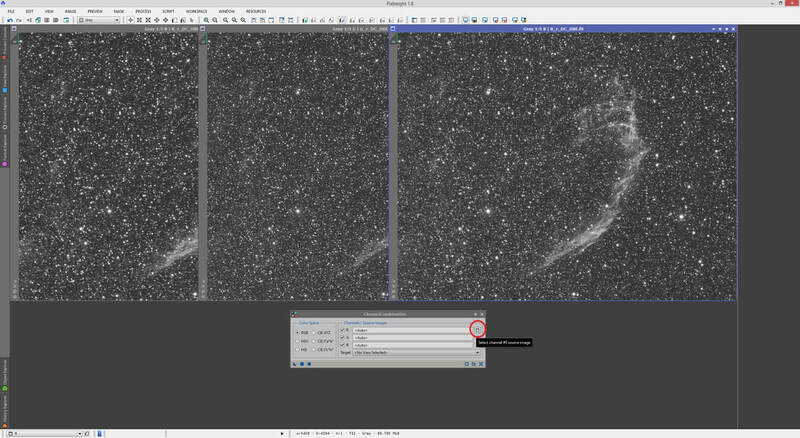 At this point, some further post-processing may be desired, such as using CurvesTransformation for final tweaking, or reducing star sizes. On the subject of Transfer Functions mentioned, below shows the same Luminance combination with my RGB colour image, but with a slight boost to Lightness and a boost to Saturation as well. In my opinion, the above is over-done, but it is simply a demonstration of the functionality provided by Transfer Functions in the LRGBCombination process.